Mathematics teachers serve as instructional leaders in their classrooms to ensure effective teaching and learning of mathematics. This chapter chronicles the conceptualization of a leadership style that promote the teaching and learning of mathematics in rural secondary schools. 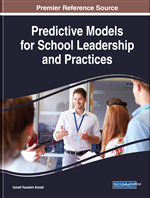 In this chapter, a prediction of a leadership style that can transform underachieving rural secondary schools for the promotion of teaching and learning of mathematics is presented. In addition, the interaction between transformational and instructional leadership effects in the mathematics classroom are discussed. The chapter defines leadership in mathematics teaching, discusses leadership for the mathematics classroom, presents how leadership was introduced in South African schools, followed by Mathematics instructions and leadership, and principal's perceptions on school leadership and its links to or effects on mathematics performance. Finally, the chapter suggests applied transformational leadership as a proposed tested model that has yielded a good performance in rural mathematics classrooms. Global education systems promote the study of Mathematics because of its importance in advancing the industrial, technological, scientific and economic national sectors. Mathematics is also a requirement for admission to various desired university programmes. Unfortunately, many students in South Africa fail to pursue their dream careers after matric because they fail Mathematics. A strong link also exists between the rural schools, disadvantaged students and underperformance in Mathematics. This situation often results in students from such schools missing out on their careers of interest. After 1994, the South African government introduced a new subject, called Mathematical Literacy to ensure that all students in schools and at Further Education and Training colleges in the country had some form of mathematical background. This became a compulsory path for all students who could not do pure Mathematics. According to the Department of Education (DoE) (2003, p. 9), Mathematical Literacy is a subject driven by life-related applications of Mathematics. Its intention is to enable students to develop the ability and confidence to think numerically and spatially and to critically interpret and analyze everyday situations and solve problems. Nonetheless, the recent trend in national examination results reveals a decline in students’ performance in Mathematical Literacy (DoE, 2015) (as they do in Mathematics), especially in rural secondary schools. Tachie & Chirese (2013) note that students’ failure in Mathematics and Mathematical Literacy in rural schools can be attributed to the external factors, such as lack of human and material resources, poor teaching methods and ‘bad’ teacher behavior. These authors also note laziness, lack of interest for the subject and absenteeism on the part of students as the other contributing factors. To contribute to this debate, this chapter suggests another factor that might contribute to the students’ failure in Mathematics and Mathematical Literacy: a favorable leadership style for the creation of a suitable and encouraging environment for both Mathematics teachers and students to perform better. Suggests a conceptual leadership style that best suits the teaching and learning of Mathematics in disadvantaged rural schools. Mathematics Instruction: Methods used by the teacher to teach mathematics in a classroom. Collaborations: The working together of either learners and or teachers in sharing information. Applied Transformational Leadership: Self-reflection and awareness of improving practice for the benefit of promoting effective teaching. Instructional Leadership: The management of curriculum and instruction by a school principal. Connections: The relation made by learners to connect their existing knowledge to new knowledge. Classroom Practice: Strategies used by a teacher to deliver content. Transformational Leadership: Transformational leadership a style of leadership where a leader works with subordinates to identify needed change, creating a vision to guide the change through inspiration, and executing the change in tandem with committed members of a group.